Look at all the Winter Activities! Use http://udottraffic.utah.gov/ to see real time road conditions across Utah. Just click a camera along your planned drive. Likely to find this information with each state’s Department of Transportation too. WINTER – Arches National Park! Arches National Park Visitor Center is open year round. Closed Christmas. Campground in Arches opens December 1st. Canyonlands National Park Island in the SKY Visitor Center closes January 1st. Canyonlands National Park Needles District Visitor Center closes November 25th. Moab Information Center is open every day 9-5 starting November 5th. Closed Thanksgiving and Christmas. Bathrooms close daily at 5 PM in winter too. Dead Horse Point State Park open year round 6 am – 10 pm. Campgrounds and yurts open year round. Heated restrooms and heated yurts. Visitor Center open daily 9 am – 5 pm starting October 30th. Closed Thanksgiving Day, Christmas Day, and New Year’s Day, still park is open those days. Trails open all winter. Please note: tours are based on conditions. Businesses have alternative itineraries and reasonable cancellation policies in winter. Moab Adventure Center provides all land-based tours throughout winter. Will shut the week after Christmas and the first week of January. High Point Hummer & ATV will do tours and rentals dependent on weather except for a mid-winter break from December 15- January 7th. Deep Desert Expeditions provides hiking, rock art tours, dinosaur track tours and photo/scenic tours all winter. Moab Cowboy is open all year round doing OHV trail tours. Outlaw Jeep Tours is available all winter. If it snows, trail tours will cancel. Ultimate UTV Adventures Open all year. Moab Horses open year-round for Horseback rides. 435-260-1582. Hike Moab is open for hiking and shuttles year round. Pinnacle Helicopters schedules tours and charters all winter. Moab In A Day will be open for guided tours of Arches and Canyonlands weather permitting. Moab Kids Club will be open all year for babysitting. Barlow Adventures open: 4wd trips, training & rentals; Moab Office: 259.3195. MoabGeotours will be open all winter with tours available for Needles, ISKY and Arches. See schedule and pricing on our website http://www.moabgeotours.com/. Dreamride offers tours for private parties year round, weather permitting. www.MoabDesertAdventures.com has guides in town and are open all year round, offering canyoneering and rock climbing through the winter, weather permitting. Adrift Adventures is running rafting trips on the Colorado River – both the Moab Daily & Westwater Canyon through October; weather dependent. Rafting starts back up April 1, 2018. Adrift Adventure Jeep tours into Arches and Canyonlands National Park via the backcountry will be ran year round, with breaks -Thanksgiving week (Nov. 19-26) & Christmas/New Years (Dec. 23 – Jan. 6); tours are weather dependent. Book adventures 435.259.8594, or adrift.net. Well Wisher open year round. 435-200-4667. Redrock Express offers private ground transportation and scenic tours to locations within 500 miles of Moab, Utah. Services are reservation based, operating 24/7 year round, with door-to-door service in luxury SUV’s and professional drivers. Reserve online www.redrockexpress.com or call 800-259-2869. Red Rock astronomy will be open this winter, conditions permitting of course! Redrockastronomy@yahoo.com, 435-210-0066. Moab SidexSide is open this winter (weather dependent and closed for a break in January). There are enclosed, heated SXSs for rent and tour. Our garage is also open for service and retail sales. Contact: moabsidebyside@gmail.com. Raven’s ZipLine closes December 1 – mid-February. Wild West Voyages is closed early November until March 1st. Moab Rafting is closed for winter. Dinosaurs – Moab Giants will be closed Nov until Presidents’ weekend. McStiff’s/Wake and Bake Café Open 6-7 days a week. 8 -11:30 AM for coffee-breakfast; 11:30 – 4:30 for lunch; 4:30 – 11 PM for dinner. Bar/Game Room stays open later if there are customers. Shut for Holiday December 16-30th for two weeks. Atomic Grill & Lounge plans on staying open all Winter. Sabuku Sushi Mid-November – Mid-march hours are Wed – Sat opening at 5 PM until about 8:30 PM. Happy Hour is 5-6 PM Wed & Thurs. Will shut for winter break Mid-January opening Valentine’s Day. Eklectica goes to winter hours mid-November. That will be 7:30 AM – 1:30 PM daily. Sweet Cravings is open November/December and opening a new gift shop titled Crave Moab which is open through December. The River Grill and Epic Bar will be under light renovations from November 27-December 22, 2017 AND January 2- February 15, 2018. During this time, the restaurant will not be open with normal hours and offering limited pre-arranged meals for guests. Breakfast will be available as our saddlebag to-go or pre-order room service. Lunch will be offered as a Saddle Bag To-go option and for dinner we will be offering a family style theme option each night from 6-8pm. We will re-open with regular business hours and operations beginning on February 16, 2018. Pancake Haus will close for the month of January for deep cleaning. http://www.SpitfireSmokehouseMoab.com will have winter hours of noon-7 Wed-Saturday, catering, deliveries. 970-618-4272. Miguel’s Baja Grill closes mid Nov. and reopens Feb.14th. Desert Bistro closes after Thanksgiving weekend for the winter. Twista sista’s has closed the doors forever. Unknown location occupant at this point. Moab Garage Co. restaurant will close for remodel in the winter. Days Inn – 426 N. Main Street open all year. 435-259-4468. Moab Comfort Suites open all year. 435-259-5455. Swimming pool closes, hot tub stays open. Sorrel River Ranch and Spa – Milepost 16 on Hwy 128. Open except for Jan 8 – Feb 8 2018. Red Cliffs Lodge – Milepost 14 on Hwy 128. Open all winter. Restaurant closes January 1- February 15 2018. Cali Cochitta B&B open all year. 435-259-4961. Big Horn Lodge open all year. 550 S Main St, 435-259-6171. Arches Drive Bed and Breakfast is open all winter. Hampton Inn open all year. A Moab House at 198 W. Center St.offers nightly lodging all year long! Moab Springs Ranch – 1266 N. Highway 191 open all year. Hot tub open all year. Pool is open mid-March through mid-Oct. 435-259-7891. StellaRuby Cottages is open year round. Reservations www.stellarubycottages.com 435-260-0215. Center Street Condos (4 units) are open for the winter season. 303-619-1054. Whispering Oaks is open all year – 435-259-7666 www.whisperingoakslodging.com Each cabin has a private hot tub and those are available in the Winter. We are about 8 miles from the Geyser Pass Trailhead. 3 Dogs and a Moose Cottages are all open year-round, and available this winter. http://www.3dogsandamoosecottages.com as well as our 3 other properties under “It Deepenz Lodging”. The Kokopelli Lodge, our Inn Towner and our West property are open all year long. We also do long term monthly rentals December thru mid- February as well as our nightly rentals. 435-259-7615. Casa de Zia at 323 Williams Way 801-637-3965 is open all year, hot tub and indoor swimming pool stays open all year as well. Hotel Moab, Best Western Greenwell, Super 8, and Motel 6 all stay open during the winter. These chains are open all winter: La Quinta, Fairfield Marriott, Homewood Suites, Greenwell and Canyonlands Best Westerns, Holiday Day Inn Express, Sleep Inn, Motel 6, Super 8. The Launch Pad B&B closes for November 10-February 31st this year. River Canyon Lodge closes November 12 to open for Presidents’ Weekend in February. The Mayor’s House B&B and Adobe Abode B&B are closing the doors and not reopening. River Canyon Lodge will close after folk festival weekend. Rustic Inn closes December 1, opens February 1. Moab Valley RV Resort open all year. Pool and hot tub close first week of November until spring. Pack Creek Campground open year round. Moab Rim Campark has RV and tent spaces December, January and February. The cabin water will be winterized those months. Cabins still available in November. Talking Mountain Yurts for Winer Accommodations…skiers, snowshoers and snowmobiliers. wkelley@talkingmountainyurts.com. Desert Moon Hotel, a residence, will have some rooms available for people overnight. The camppark will accept some RV traffic if it comes through in the winter months between December and January. Those spots are winterized, because of lower temperatures water might be sketchy. Up the Creek Closes on October 22nd for the winter. Portal RV Resort closes December 1st until mid-February. ACT campground will close for RV ‘s November 1st; Cabin Rooms and tents will close November 15. We will open March 1, 2018. Possibly open for Feb 15 for Valentines or maybe weekends in Feb.
Royce Electronics open Monday – Friday 9 am – 6 pm. Tom Till Gallery has reduced hour in the days approaching Christmas when they close for the winter. But folks can schedule an appointment. The Rave’N Image stays open 7 days a week through the end of the year, but starts closing earlier in the beg of November. We will close in the beg of Jan for a remodeling job that will last until the end of the month. Beg of Feb we are open 4 days a week.Starting VAlentine’s weekend we’re back to 7 days/week. Moab Gear Trader open 7 days a week offering new and used outdoor gear and clothing. Moab’s Only ski and winter recreation shop. We are Moab’s Winter Sports Headquarters. Rim Cyclery has x-country touring skis for rent. GearHeads has snowshoes for rent. Pagan Mountaineering has ice axes, crampons, snow shoes, and poles for rent. Desert Thread is open 10am-5:30pm, Tuesday-Saturday (year round). Social stitch night every Wednesday is from 7-9pm. Classes available on a monthly basis. 29 E Center Street, 435-259-8404. Indigo Alley will be closed for the month of January. It’s Sew Moab LLC will be open 10:00am – 5:00pm. Sandstone Gallery remains open through winter, 59 S Main St.
Back of Beyond Books winter hours: 9 AM – 6 PM, 7 days a week. Closed Thanksgiving Day. Tumbleweed, 31 N Main St. is open through Christmas, then closed until February 12thish, around Valentine’s Day! The T-Shirt Shop closes by December to open end of February. Shirtails cuts back hours in November to close for remodeling. Open March 1. Moab is a small town the shops should be easy to locate. Anything within 10 miles of Moab have been filling by noon or earlier, including Ken’s Lake. Upper River and 313 campsites have been filling between noon and 3pm (earlier on weekends and event days). The Ledges are typically filling by late afternoon. Dispersed camping, following the restrictions and regulations (mandatory to have a portable toilet, forbidden to gather firewood out there, use pre-existing sites indicated by a rock ringed fire pit or brown lathing sign), is also an option if they will be arriving before dark. Visitors need to know that they should have back-up plans if arriving after noon. They could consider making a reservation at a private campground for their first night, hotel reservation or lazy lizard stay and searching for a site the following morning, IF they want to drive around. If they are arriving late afternoon or evening, reservations at private campgrounds are the way to go if they are planning to stay in the Moab area. REMIND users BLM quiet time is 10 PM – 7 AM. Please do not disturb folks in BLM sites between these hours. Pull over before Moab and resume in the morning if arriving super late. We think the days of driving to Moab and finding a site in our campgrounds after mid-day is dwindling. Make reservations with http://discovermoab.com/campgrounds_private.htm and remove the anxiety of locating a spot to camp. Forest Service also announces the need to buy firewood where you burn it, across the Nation to prevent spread of pest and disease. Answers for availability for Jeep safari April 7-16 2017. Packcreek Campground has dry camping. moabrimcampark@gmail.comWe have a few tent sites left for the entire week and several that are almost the entire week. We also have some power and water only RV spots available until 4/12 if they are only looking for a few days. Moab Valley RV Resort only has a couple of tent sites left, NO cabins, NO RV’s. The Old Airport will be open for RV camping April 7-16 2017. No Fires. Portable toilet is Mandatory. It is south of Moab about 8 Miles on Hwy 191, turn east onto Old Airport Road at the stop sign go across the Spanish Valley Drive. Do not drive on the plants, stay on the pavement. It is free. It is closed to camping all other times of the year. But everywhere is going to be over the top busy this week. Extra law enforcement is hired to keep people from illegally camping. The author of the bestselling Fifty Places series (more than 500,000 copies sold) returns with a globe-trotting travel guide to the best and most beautiful places to drink beer around the world, as described by industry insiders! Fifty Places to Drink Beer Before You Die, By Chris Santella. What is the most unforgettable place you’ve ever enjoyed a refreshing pint of pale ale or pilsner? In Fifty Places to Drink Beer Before You Die (Abrams Image; September 20, 2016; U.S. $24.95; Hardcover), Chris Santella explores some of the world’s greatest beer towns, as well as places to enjoy a cold one after a day of great sport. Venues range from beer festivals (like Munich’s Oktoberfest and Telluride Blues & Brews) and brewpubs (like Hair of the Dog in Portland, Oregon) to après ski (the hot tub at Tordrillo Mountain Lodge in Alaska) and brewery tours (like the one at Anchor Brewing in San Francisco). With a mix of national and international destinations firsthand accounts from craft brewing pioneers like Jim Koch (founder of Boston Brewing), Ken Grossman (founder of Sierra Nevada) and Governor John Hickenlooper (co-founder Wynkoop Brewing), and vibrant photographs that bring locales to life (a hallmark of the series), Fifty Places to Drink Beer Before You Die makes the perfect gift for the beer lover in your life. Wellington, New Zealand… and many more! Chris Santella is a regular contributor to the New York Times, the Washington Post and Trout. His work has also appeared in The New Yorker, Travel + Leisure, and the Wall Street Journal. Santella is the author of 12 other titles in the Fifty Places series, as well as Fifty Favorite Fly-Fishing Tales, Why I Fly Fish, The Tug is the Drug and Cat Wars (with Dr. Peter Marra). The town of Moab sits between Arches and Canyonlands National Parks, amongst a remarkable patchwork of canyons, mesas and deep river gorges. It’s easy to enjoy the thousands of square miles of red rock vistas from the seat of your car…though thousands come each year to enjoy them from the seat of a mountain bike. And you can rest assured that though this is Utah, a cold beer will be waiting at the end of the day. Most trace the roots of modern mountain biking to Marin County California in the early 70s, though a case could be made that people have been going off road since the bicycle was created. (The Marin Museum of Bicycling points out that in 1896, the 25th Infantry Bicycle Corps, a regiment of African American riders, biked from Missoula to Yellowstone to test the potential of customized bicycles for military use in mountainous terrain.) Armed with old single speed bikes outfitted with balloon tires, a handful of Marin teenagers (known as the Larkspur Canyon Gang) attacked Mount Tamalpais above Mill Valley. Other road bikers soon followed suit, and not long after, the first race was organized – Repack – so named because riders would have to repack their brakes with grease after each race, thanks to the braking the steep descent demanded. Hence a new sport was born…though it wouldn’t be called mountain biking until 1979. Enthusiasts recognized the potential of Moab and its geologic wonders as a biking hub a few years later, though it really came on the scene in 1986 with the first Canyonlands Fat Tire Festival. As more riders began to make their way to Moab, the existing trail infrastructure began to seem inadequate. The community came together to garner resources to improve and expand the region’s single track system; the result was 100 new miles of trails, cementing Moab’s reputation as one of the world’s foremost mountain biking destinations. As mentioned above, Moab has trails to suit riders with a range of skill levels. Russ shared a few of his recommendations. “Beginners will find lots of terrain at Dead Horse Point State Park as well as over at Moab Brands. For intermediate riders, I like the Klondike Bluff area and Magnificent 7. The trails here add enough rocks to keep you on your toes, but not enough to have you fearing for your life if you’re a less seasoned rider. For advanced riders, Slickrock is a must.” Slickrock is among the world’s most famous mountain bike trails. The 10+ mile trail twists, climbs, turns and descends on Navajo Sandstone, the geologic formation that accounts for many of the region’s iconic rock attractions. Along the way, Slickrock offers up some tremendous Colorado River vistas. For riders seeking a multi-day adventure, there’s the White Rim Trail, which runs 100 spectacular miles through Canyonlands National Park. Russ Fracente has been been enjoying bicycling since childhood, but really began riding hard after moving to Moab. He is Assistant Sales Manager at Poison Spider Bicycles, which has been consistently rated one of America’s best bike shops. Getting There: The closest commercial airports to Moab are in Grand Junction, Colorado (2 hours driving distance) and Salt Lake City (4 hours’ drive). Salt Lake City is served by most major carriers; Grand Junction is served by several carriers, including American Airlines (800-433-7300; www.aa.com) and United (800-864-8331; www.united.com). Best Time to Visit: You’ll find the mildest weather in spring and fall. Rain is not generally an issue. Spots to Visit: The Moab Brewery (435-259-6333; www.themoabbrewery.com); Eddie McStiff’s (435-259-2337; www.eddiemcstiffs.com); and Poison Spider Bicycles (435-259-7882; http://poisonspiderbicycles.com) for cycling guidance. 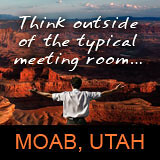 Accommodations: The Moab Area Travel Council website (www.discovermoab.com) lists lodging options around Moab. With the fabulous weather camping is predominantly sought in the desert around Moab Utah. The tricky bit is determining the location for the convenient access of specific adventures. Which adventures? Mountain biking, hiking, climbing, 4-wheeling and OHV trail riding are among those. Which Campgrounds Have Access to Your Activity? Sand Flats Recreation area is home to the Slickrock Bike Trail and contains the Porcupine Rim Trail. Camping is limited to 9 various locations amounting to 120 individual sites. Besides the mountain biking to be had, motorized use enjoys, Hells Revenge and the Fins and Things trails. Sand Flats is attractive for the owners of OHV’s which are NOT street legal. These OHVs – UTVs/ATVs/Motorcycle trail bikes can be ridden right out of camp to the trails in Sand Flats. Similarly, Horsethief Campground off of Hwy 313 serves OHV users desiring to ride out of camp. There is a tremendous network of trails in the region north of Moab. It is best to have maps of the area to see how all the segments mesh. Nearby is Cowboy Camp, a little spot for tent camping – no camp trailers allowed. From this Hwy 313 camp, mountain bikers can connect to the Navajo Rocks trail system, the Intrepid Trail system in Dead Horse Point State Park and/or the many routes in the Gemini Bridges area, like the Magnificent Seven and the newest Horsethief bike trail network. For the climbers, Wall Street on Hwy 279 is a popular hang out to belay buddies. Close to the climbing are Jaycee Park and Williams Bottom camping areas. Those have nice tent camping and have the essential pit toilet for conveniently fulfilling the Leave No Trace adage. Near Big Bend Campground on Hwy 128, the Bureau of Land Management has established a proper parking area for bouldering. Find a map in Karl Kelley’s, High on Moab, the newest and all around informative climber guide including 21 challenging boulders. Drinks Canyon, Hal Canyon and Oak Grove Campgrounds would also be places to stay to be close to Big Bend Boulders. Also on Hwy 128, consider Lower Onion Creek for camping access for rolling right out of camp to 4-wheel or OHV Onion Creek and connecting with Top of the World and Polar Mesa. Fisher Towers is best as a tent camping spot and serves up some nice hiking and climbing. Out on Kane Creek Road, Moonflower Canyon shall have fewer walk-in tent sites. Spring Canyon walk-in tent sites out along Kane Creek Road will be closed and reclaimed. Find additional walk-in sites added to Kings Bottom to balance out the removal of the others. Got a motorhome? Toy hauler? Head out to the Ledges camping area where there are 105 sites with access to dirt trails from camp. Prefer a full hook-up? Make reservations with a commercial campground in Moab. Street Legal UTVs are able to drive to trails. Archview Resort is the only campground near Moab to ride an ATV out of camp and get that full hook up for an RV. North 38 miles, in Thompson Springs are hookups at the Ballard RV Park. Trails can be ridden out of there. Find out more in the Third Edition of Charles A. Wells, Guide to Moab, UT Backroads & 4-Wheel-Drive Trails. Behind the Rocks is 14 miles south of Moab. Turn west off of Hwy 191. There will be no camping signs posted here. Camping is not allowed from the turn off for about 3 miles. After that distance some sites for tent camping appear. Keep going. The first two dirt roads off to the south go to houses. Keep going. The next roads lead to a tear drop design of RV sites. The most important matter here is to have a portable toilet to use in the Behind the Rocks area. Tent campers can purchase wag-bags (a means of packing out human refuse) from the Moab Information Center. Nice trail riding out here, dappled with arches. The Moab Information Center is teeming with area maps. Stop in to get maps or guide books to see the many trail options available in and around Moab Utah. It is located at the corner of Main and Center Street, open 7 days a week. Arches National Park is reserved online using recreation.gov. It sells out months in advance. No hookups. Dead Horse Point, Utah, State Park also reserves camping online. Dead Horse has electrical hookups. It too sells out months in advance. Canyonlands National Park has first come, first served camping. No OHV use allowed in the national parks of Moab. So the parks are great for hikers especially. When the weather is fine, camping is popular. Most important about backcountry use, enthusiasts are required to Leave No Trace, which means using portable toilets or camping in sites with pit toilets. Gathering firewood is prohibited. Bring your own or buy bundles from many shops in Moab. South town Maverick has a free dump station for RVs. Bring a hose to fill up with water from the side of the Maverick store seen from the dump station. Spanish Trail Shell can refill propane tanks and allows filling water from a faucet along the curb near where the propane is dispensed. Again bring a hose to fill an RV. Farm and City Seed and Feed does it all, dump, water ($5 fee), and propane in one stop. Find more camping details on http://discovermoab.com/campgrounds.htm or call 435-259-8825. In mountain bike circles, the Slickrock Trail is famous! It requires stamina and skill to negotiate the petrified sand dunes that comprise the trail. Mountain biking has escalated with travel for riding and trail building by destinations across the United States and the world. Moab has stayed relevant to mountain biking due to the effort of the volunteers of the Moab Trail Mix. Now alternative slickrock can be ridden for less extreme pedaling, yet there is ample expert terrain too. There are trails that are sufficient for the entire family in Moab. If you haven’t bicycled Moab lately, you haven’t biked Moab. You can no longer say, ‘Been there, done that’ about Moab. The uranium miners steered into the far reaches around Moab in the 1950s using two wheel drive and the granny gear. As that boom passed and recreation dawned, fat tire biking used those dirt roads along with four wheel drive users. As recreation booms, an abundance of travelers cued a variety of segments for single track mountain bike pedaling, ATV only trails, single track trail motorcycling, as well as, 4×4 vehicle use on Moab’s surrounding trails. Check out DiscoverMoab.com for the quintessential overview of Mountain Bike trails of Moab. Green Circles, Blue Squares and Black Diamonds have been assigned to trails to better enable visitors to select a trail according to ability. A network of trails are found in some areas so a carload can travel together yet ride separate trails in relation to recovering from yesterday’s epic ride, or start with an easy one to progress to another level of skill or ply those skills for more difficult trail lines. Obviously, if you haven’t pedaled Moab lately, you really haven’t pedaled Moab. Come check out 111 miles of mountain bike trails in Moab. Print the maps on http://discovermoab.com/biking.htm and bring them along. Or purchase each map at a local Moab bike shops for $2-$3 each. That money goes into the treasury of the Moab Trail Mix, the fine organization building and maintaining Moab’s excellent variety of mountain bike trails. Need more travel information? Phone 435-259-8825 Monday – Friday 8 AM – 5 PM Mountain Standard Time or email info2@discovermoab.com.